The Rocky Mountains, often called the Rockies, are a broad mountain range in western North America. The Rocky Mountains stretch more than 3,000 miles (4,800 kilometers) from British Columbia, in Canada, to New Mexico, in the United States forming the Continental Divide sometimes known as the "backbone" of North America. The highest peak is Mount Elbert, in Colorado, which is 14,440 feet (4,401 meters) above sea level. Mount Robson, at 12,972 feet (3,954 meters) is the highest peak in the Canadian Rockies. The Rocky Mountain System is a United States physiographic region, a jewel of natural biodiversity, and the third dimension of earthly beauty that only a mountain range can present. The Rocky Mountains are commonly defined to stretch from the Liard River in British Columbia, down to the Rio Grande in New Mexico. They can also be described as running from Alaska to Mexico, but usually those mountains are considered to be part of the entire American cordillera, rather than part of the Rockies. 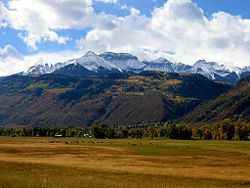 The younger ranges of the Rocky Mountains uplifted during the late Cretaceous period (140 million to 65 million years ago), although some portions of the southern mountains date from uplifts during the Precambrian age (3,980 million to 600 million years ago). The mountains' geology is a complex of igneous and metamorphic rock; younger sedimentary rock occurs along the margins of the southern Rocky Mountains, and volcanic rock from the Tertiary (65 million-1.8 million years ago) occurs in the San Juan Mountains and in other areas. Millennia of severe erosion in the Wyoming Basin transformed inter-mountain basins into a relatively flat terrain. 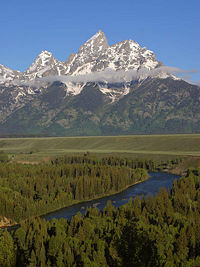 Examples of granitic intrusions of folded and faulted rocks of Paleozoic and Mesozoic age would include the Tetons and the other north-central ranges. Periods of glaciation occurred from the Pleistocene Epoch (1.8 million-70,000 years ago) to the Holocene Epoch (fewer than 11,000 years ago). Recent episodes included the Bull Lake Glaciation that began about 150,000 years ago and the Pinedale Glaciation that probably remained at full glaciation until 15,000-20,000 years ago. Ninety percent of Yellowstone National Park was covered by ice during the Pinedale Glaciation. The "little ice age" was a period of glacial advance that lasted a few centuries from about 1550 to 1860. For example, the Agassiz and Jackson glaciers in Glacier National Park reached their most forward positions about 1860 during the little ice age. 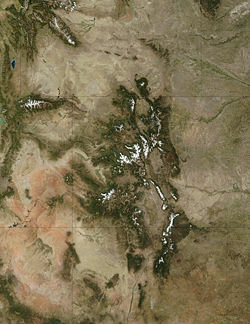 The Continental Divide is located in the Rocky Mountains and designates the line at which waters flow either to the Atlantic or Pacific Oceans. Triple Divide Peak (8,020 feet/2,444 meters) in Glacier National Park is so named due to the fact that water which falls on the mountain reaches not only the Atlantic and Pacific, but the Arctic Ocean as well. Since the last great Ice Age, the Rocky Mountains were a sacred home first to Paleo-Indians and then to the Native American tribes of the Apache, Arapaho, Bannock, Blackfoot, Cheyenne, Crow, Flathead, Shoshoni, Sioux, Ute, and others. Paleo-Indians hunted the now-extinct mammoth and ancient bison (an animal 20 percent larger than the modern bison) in the foothills and valleys of the mountains. Like the modern tribes that followed them, Paleo-Indians probably migrated to the plains in fall and winter for bison and to the mountains in spring and summer for fish, deer, elk, roots, and berries. In Colorado, along the crest of the Continental Divide, rock walls that Native Americans built for driving game date back 5,400-5,800 years. A growing body of scientific evidence indicates that Native Americans had significant effects on mammal populations by hunting and on vegetation patterns through deliberate burning. Recent human history involving the Rocky Mountains is one of rapid change. The Spanish explorer Francisco Vásquez de Coronado—with a group of soldiers, missionaries, and African slaves—marched into the Rocky Mountain region from the south in 1540. The introduction of the horse, metal tools, rifles, new diseases, and different cultures profoundly changed the Native American cultures. Native American populations were pushed from most of their historical ranges by disease, warfare, habitat loss (eradication of the bison), and continued assaults on their culture. The Lewis and Clark expedition (1804-1806) was the first scientific reconnaissance of the Rocky Mountains. Specimens were collected for contemporary botanists, zoologists, and geologists. The expedition was said to have paved the way to (and through) the Rocky Mountains for European-Americans from the East, although Lewis and Clark met at least 11 European-American mountain men during their travels. Mountain men, primarily French, Spanish, and British, roamed the Rocky Mountains from 1720 to 1800 seeking mineral deposits and furs. After 1802, American fur traders and explorers ushered in the first widespread white presence in the Rockies. The more famous of these Americans included William Henry Ashley, Jim Bridger, Kit Carson, John Colter, Thomas Fitzpatrick, Andrew Henry, and Jedediah Smith. In 1832, Benjamin Bonneville led the first wagon train across the Rocky Mountains by using Wyoming's South Pass. The Mormons began to settle near the Great Salt Lake in 1847. In 1859, gold was discovered near Cripple Creek, Colorado, and the regional economy of the Rocky Mountains was changed forever. The transcontinental railroad was completed in 1869, and Yellowstone National Park was established in 1872. While settlers filled the valleys and mining towns, conservation and preservation ethics began to take hold. President Harrison established several forest reserves in the Rocky Mountains in 1891-1892. In 1905, President Theodore Roosevelt extended the Medicine Bow Forest Reserve to include the area now managed as Rocky Mountain National Park. Economic development began to center on mining, forestry, agriculture, and recreation, as well as on the service industries that support them. Tents and camps became ranches and farms, forts and train stations became towns, and some towns became cities. Economic resources contained within the Rocky Mountains are varied and abundant. Minerals found in the Rocky Mountains include significant deposits of copper, gold, lead, molybdenum, silver, tungsten, and zinc. The Wyoming Basin and several smaller areas contain significant reserves of coal, natural gas, oil shale, and petroleum. For example, the Climax mine, located near Leadville, Colorado, was the largest producer of molybdenum in the world. Molybdenum is used in heat-resistant steel in such things as cars and airplanes. The Climax mine employed over three thousand workers. The Coeur d'Alene mine of northern Idaho produces silver, lead, and zinc. Canada's largest coal mines are in the Crowsnest Coal Field near Sparwood, British Columbia and Elkford, British Columbia; additional coal mines exist near Hinton, Alberta. Abandoned mines with their mine tailings and toxic wastes dot the Rocky Mountain landscape. In one major example, eighty years of zinc mining profoundly polluted the Eagle River and its banks near north-central Colorado. High concentrations of the metal carried by spring runoff harmed algae, moss, and trout populations. An economic analysis of mining effects at this site revealed declining property values, degraded water quality, and the loss of recreational opportunities. The analysis also revealed that cleanup of the river could yield $2.3 million in additional revenue from recreation. In 1983, the former owner of the zinc mine was sued by the Colorado attorney general for the $4.8 million cleanup costs; five years later, ecological recovery was considerable. Agriculture and forestry are major industries. Agriculture includes dryland and irrigated farming and livestock grazing. Livestock are frequently moved between high-elevation summer pastures and low-elevation winter pastures. 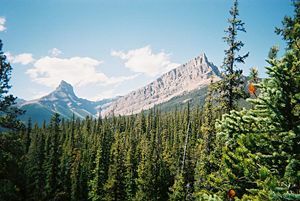 Human population is not very dense in the Rocky Mountains, with an average of four people per square kilometer (ten per square mile) and few cities with over 50,000 people. However, the human population grew rapidly in the Rocky Mountain states between 1950 and 1990. The 40-year statewide increases in population range from 35 percent in Montana to about 150 percent in Utah and Colorado. The populations of several mountain towns and communities have doubled in the last 40 years. Jackson Hole, Wyoming, increased 260 percent, from 1,244 to 4,472 residents, in 40 years. Every year the scenic areas and recreational opportunities of the Rocky Mountains draw millions of tourists from all over the world. Unlike many other rugged mountainous regions throughout the world, the Rocky Mountain region has modern highways, most of which are open year-round. 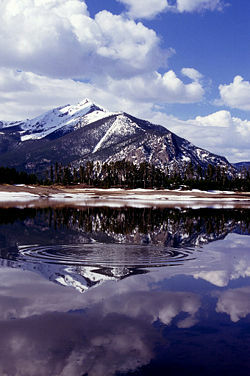 The Rocky Mountains are one of the most popular recreation regions for North Americans. Camping, hiking, all manner of winter sports, and sightseeing draw people to this region. The region abounds with National Parks, resorts, and recreation sites with all kinds of amenities for the traveler. Highways were built through spectacular mountain passes and valleys that connect growing areas of developing populations. The cities of Denver, Colorado, Salt Lake City, Utah and Calgary, Alberta all are major population centers of the Rocky Mountain region. Glacier National Park (U.S.) and Waterton Lakes National Park border each other on the U.S./Canadian border and collectively are known as the Waterton-Glacier International Peace Park. In the winter, skiing is the main attraction. The Rockies feature many large ski resorts located in Colorado, Montana, Utah and Wyoming in the United States, and Alberta and British Columbia in Canada. There are three main levels of vegetation in the Rocky Mountain environs. They are: the montane, the subalpine, and the alpine levels. The montane can include anything from sagebrush to dense conifer forest depending on the elevation or the location of dry leeward or wet windward side of the mountains. The subalpine is found below the tree-line and above the montane. 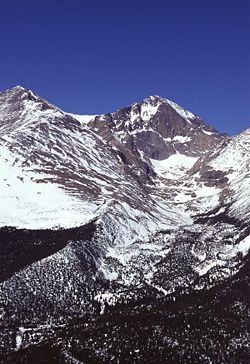 The alpine is the highest level biome usually located at about 10,000 feet in altitude. The alpine level has the harshest climate with most plants being small perennial groundcover which grow slowly because of the poor soil conditions. Dazzling arrays of color, texture and form await the gazers of flowers and plants from the boreal forests and grasslands to the subalpine and alpine. The Rocky Mountain landscape is also home to some of the most captivating animals to be found in North America. Travelers can encounter wild big horn sheep alongside a highway in the Banff National Park in Alberta, Canada. The powerful grizzly bear, black bear, moose, varieties of deer, elk and the mountain cougar all live in this mountain range. The forests of this vast mountain range also include many species of owls, eagles, and hawks as well as foxes, bobcats, marmots, lynx, rabbits and badger and a vast array of other wildlife forms, fish included. The Rocky Mountains have a highland climate. The average temperature in the Rockies per year is 43 °F (6 °C). July is the hottest month with an average temperature of 82 °F (28 °C). In January, the average monthly temperature is 7 °F (−14 °C), making it the coldest month in the Rockies. The average precipitation per year is approximately 14 inches (360 mm). Summers in the Rockies are warm and dry, because the western fronts impede the advancing of water-carrying storm systems. The average temperature in summer is 59 °F (15 °C) and the average precipitation is 5.9 inches (150 millimeters). Winter is usually wet and very cold, with an average temperature of 28 °F (−2 °C) and average snowfall of 11.4 inches (29.0 centimeters). In spring, the average temperature is 40 °F (4 °C) and the average precipitation is 4.2 inches (107 millimeters). And in the fall, the average precipitation is 2.6 inches (66 millimeters) and the average temperature is 44 °F (7 °C). The main language of the Rocky Mountains is English. But there are also linguistic pockets of Spanish and Native American languages. 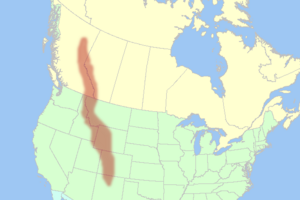 The culture and religion of the Rocky Mountains reflect the homogeneous nature of North America in general. Both Canadian and the U.S. portions of the Rockies were settled primarily by European immigrants. The Rocky Mountains were the last frontier to cross from east to west and Chinese workers were among those recruited to help build both the U.S. and Canadian transcontinental railways across the rugged divides. The Chinese also brought their culture and eventually established successful businesses and significant communities along the west coast of the U.S. and Canada. Everywhere throughout the Rockies there was already a foundation of native indigenous cultures that had pre-existed for thousands of years. Christian missionaries of both Catholic and Protestant denominations arrived with the pioneer settlers and established communities of faith throughout the Rocky Mountain region. The Catholic Jesuits were the first missionaries to arrive, some as early as the 1600s with the French fur traders. Their goal was to bring Christianity to the native peoples. Today, however, the houses of faith of many world religions can be found with the influx of immigrants from scores of different nationalities. Hartman, Todd. "Park Nitrogen Levels Twice 'Critical Load.'" Rocky Mountain News (March 11, 2004). Available online from Purified Water to Go. Retrieved August 15, 2007. Rasmussen, Ray. Rocky Mountain Wildflower Photography. Retrieved August 15, 2007. All links retrieved July 16, 2015. This page was last modified on 16 July 2015, at 15:01.